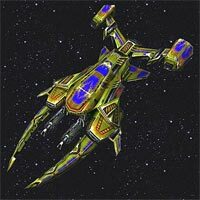 A small unmanned ship made for recognition of enemy planets. The ship is made plain and simple and there is barely enough room for the spy equipment and the powerful ion engine, capable of small hyperspace jumps, leading to unbelievable velocity. The body is built from a special crystal alloy.